The Tempio Light brings an added dimension to the popular Tempio Field gun. Featuring a forged action and fore-end assembly crafted from a high tech aluminum alloy; the Tempio Light combines almost featherweight lightness for carrying and handling ease with unmatched durability and function. 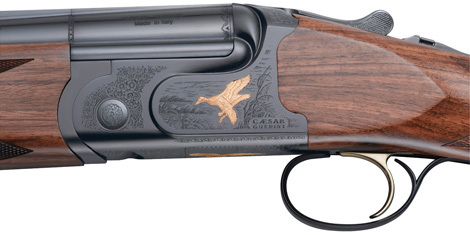 Additionally, the stock incorporates a hollowed out section to bring the light weight gun into perfect balance. The uniquely designed action features a hard anodized blued finish with durability and corrosion resistance qualities similar to those found on military spec. firearms. All wear points between the action and barrels are steel providing longevity similar to our all steel actions. Visually complementing the Tempio Light’s receiver is Bulino style engraving with gold game scenes accompanied by fine scroll work. The deluxe grade natural oil finished Turkish walnut and fine 26 lines-per-inch checkering further enhance the Tempio Light’s appearance. The Tempio Light is available in 12, 20 and 28 gauges and in 26″ and 28″ barrel lengths and as a two-barrel 20/28 gauge combination set. 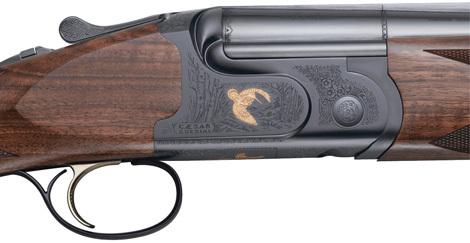 All Caesar Guerini field guns come with a velvet lined lockable hard case and five precision patterned flush chokes (CYL, IC, M, IM, F). A plastic choke case is also included.